A fracture of the scaphoid, though a relatively frequent wrist injury, is often ignored, overlooked, or mistakenly attributed to a wrist sprain. This is due in large part to the subtlety of its symptoms. Unlike most other broken bones, the area around the scaphoid may not be noticeably swollen or intensely painful. According to HSS Hand Specialist Scott Wolfe, MD, "because of the scaphoid fracture’s relatively innocuous symptoms, it may be mistaken for a sprain and remain undiagnosed for months or years, leading to long-term consequences of painful arthritis." A scaphoid fracture is usually caused by a fall on the outstretched hand, and it occurs most often in young, active patients. Frequently, the injury occurs in sporting events such as skiing or snowboarding, although it can also occur as a result of a motor vehicle accident or similar traumatic force on the hand and wrist. Dr. Wolfe notes that extra vigilance should be paid to every wrist injury, since the fleeting symptoms of a scaphoid fracture - in addition to its complicated shape and precarious blood supply - can lead to a failure of the two fractured bone ends to unite (also called a nonunion). The scaphoid (or carpal navicular) resides between the thumb and the bones of the forearm, and it resembles a large cashew nut. It is a crucial component of the wrist mechanism and coordinates the motion and position of all of the other wrist bones. 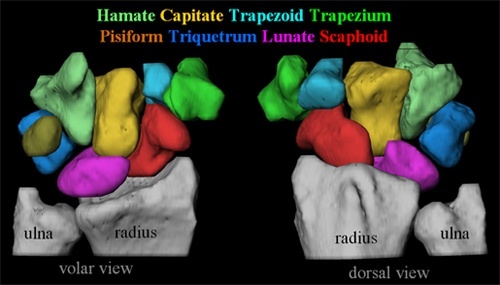 This color-coded diagram maps each of the 8 carpal bones, with the scaphoid in red. Wrist bones are so small, complex, and intricately related that they will rotate out of position, conduct forces abnormally, and begin to cause degenerative arthritis (osteoarthritis) if the scaphoid does not heal in a timely fashion. Since the scaphoid provides cohesiveness and functional coordination to the two rows of carpal bones in the wrist, disruption of the scaphoid allows the two sets of bones to act in an uncoordinated manner. They begin to develop shear forces and high stresses, and that leads to cartilage loss and, eventually, arthritis. Compounding the issue is the tenuous blood supply to the scaphoid, which is comprised of a dominant vessel which enters the bone at its waist (midsection) along the dorsal (back side) ridge. Since bones require a steady flow of blood to ensure proper healing, the scaphoid is uniquely vulnerable. A fracture through the waist or proximal third of the bone (closest to the forearm) can disrupt the dorsal blood vessel and isolate the proximal fragment (closest to the forearm), preventing its nutrition and, ultimately, its healing. For this reason, Dr. Wolfe stresses that it is imperative that a scaphoid fracture be detected and treated as soon as possible. A physician can use several methods to determine a possible fracture of the scaphoid. While a comprehensive physical exam is always performed on an injured patient, the imaging of the potential fracture is dependent on the type and timing of injury and the particular physical exam findings. Symptoms: Bruising or swelling of the wrist following a fall is suggestive of a serious wrist injury, particularly when associated with loss of motion of the thumb or wrist, or pain with hand gripping or lifting. Unlike the more common fracture of the radius, there is usually no visible deformity with a scaphoid fracture. Physical examination: Tenderness in the anatomical snuffbox (the hollow between the tendons on the thumb side of the wrist) is the characteristic sign of a scaphoid fracture, though it is very non-specific. The doctor will examine several other bony prominences about the wrist and ask the patient to gently move the wrist and thumb through a range of motion. After reviewing symptoms and examining for physical signs, the physician will order a set of x-rays, and possibly additional imaging tests such as a bone scan, computed tomography (CT), or magnetic resonance imaging (MRI). X-rays: X-rays continue to be the first line of detection for scaphoid fractures. Three high quality views of the wrist from different angles will usually be obtained; however, because a scaphoid fracture, especially when nondisplaced, may not be visible on x-rays in the early days after an injury, the wrist may be placed in a cast for ten days, and the patient may be asked to return for another set of x-rays. At this point, a healing fracture will characteristically become more visible on x-rays because the normal healing process leads to removal of some of the jagged edges of the broken bone, causing the fracture to appear wider. Special views that are specific to the scaphoid may also be taken. Alternatively, advanced imaging studies may be obtained for earlier detection. Computed tomography (CT) and bone scans: If followup x-rays of the injury are inconclusive but symptoms still point to a possible scaphoid fracture, other imaging studies may be used to provide a more detailed image of the wrist. Bone scans are used as a highly sensitive early diagnostic tool, revealing abnormal bone activity while being nonspecific for fractures. Three phase bone scans can also demonstrate the blood flow to the scaphoid. This type of early detection is advantageous for highly active patients wishing to return to work or sports. A limitation of a bone scan is that it is very sensitive to all areas of bone turnover (the rate at which bone normally builds up and breaks down); in some cases it may be positive when, in fact, a scaphoid fracture does not exist due to the presence of regional arthritis, for example. CT scans may be ordered to define the integrity of the fracture fragments and the potential need for bone graft in high energy injuries especially when the fragments are displaced. 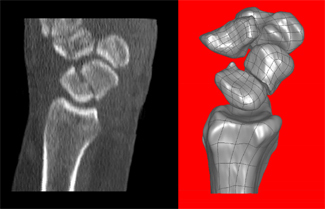 Sagittal reformatted computed tomography (CT) scan shows a fracture through the mid waist of the scaphoid (arrow). Three dimensional (3D) reformatted images produced from high resolution CT scanners are often helpful in surgical planning. Magnetic resonance imaging (MRI): This type of imaging study is highly accurate and also supplies useful information concerning the blood supply of the bone fragments. Unlike CT and radiographs, MRI also uses no ionizing radiation. Though more costly, an MRI scan is beneficial for those who require an extremely rapid diagnosis and whose occupation will not permit the recommended ten-day casting period. MRI can detect a scaphoid fracture and surrounding soft-tissue injuries on the same day as the injury. In the last decade, there has been an increased awareness among primary care physicians, pediatricians, and general orthopedists in early diagnosis and treatment of scaphoid fractures in order to prevent non-union and generalized wrist arthritis. However, patients should also be vigilant and knowledgeable about scaphoid fractures if they have experienced - or are at risk of experiencing - trauma to the hand or wrist. "The treatment of scaphoid fractures has seen especially dramatic changes over the last 10 years," says Dr. Wolfe. "Hand specialists have made surgical treatment safe and reliable to a point where there has been a notable paradigm shift from treating scaphoid fractures in a cast to treating them operatively. In concert with that change in philosophy has been a series of improvements in surgical equipment and techniques. Casting, however, remains a safe and effective option for healing in many cases." One challenge of treating scaphoid fractures is their lengthy healing time. The peculiarity of its blood supply is the primary reason for this prolonged healing period. Whereas other fractures in the upper extremity require an average of 6 weeks, a scaphoid fracture requires an average of 12 weeks if treated immediately, and as long as 6 months if the diagnosis is delayed. Dr Wolfe points out, "Despite the advances of surgical treatment of scaphoid fractures, casting remains a safe, effective, and viable option for nondisplaced fractures." Technique: A properly applied cast provides close to a 100% rate of healing for non-displaced fractures when treated within a few days of injury. The cast extends from the midportion of the thumb to above the elbow for a length of 6 weeks (long arm cast). After this period of time, the cast is removed, x-rays are taken, and another cast from the thumb to below the elbow is put in place for 6 additional weeks (short arm cast). X-rays and physical examination are repeated to confirm union, but Dr. Wolfe warns that a painless wrist at this point does not necessarily indicate healing, and further studies may be necessary before allowing return to activities. Benefits: Casting is a time-honored treatment method that enjoys a high rate of success for scaphoid fractures detected soon after injury and with minimal or no displacement. For patients who neither require nor desire a surgical approach, casting remains an appropriate option. Healing: An average of 12 weeks is required. After this period of time is completed, the physician may order computed tomography to confirm bony healing. Risks: The risk of cast problems is low. Skin irritation, itching, muscle atrophy. and stiffness are the most common associated side effects of cast treatment. When compared with surgical treatments, there are very few potential internal complications with this approach. However, more serious complications can include skin pressure sores and cutaneous nerve compression with transient numbness. Displaced fractures or highly complicated fracture patterns usually require an operative approach to realign the fracture fragments and hold them together until healing. Fractures that have been determined to have lost blood supply may require a specialized type of surgery that employs transfer of a bone graft with a new blood supply. Technique: Most commonly, an incision is made on the palm side of the hand, and the surgeon will typically implant wires or a screw to firmly fix the fracture (internal fixation). Depending on the type and location of the fracture, however, an incision on the back of the wrist may be employed. Occasionally, the surgeon will need to use bone graft to help repair defects in the bone; usually this bone graft can be harvested from the same arm through a small incision near the wrist. Rarely, graft from the pelvis will be utilized if more structural stability is required. Benefits: The surgeon can readily visualize the different fragments and precisely fit them together. Any other injured structures (ligaments, cartilage defects) can be addressed at the same time. Rigid fixation with a screw increases the chance that the bone fragments will unite. Healing: Average time to union of the scaphoid is twelve weeks. Depending on the rigidity of the bone fixation and need for bone graft, the wrist may be casted for 4, 6, 8, or 12 weeks. On occasion, if the surgeon is able to use an approach that divides no additional supporting structures around the scaphoid, a postoperative splint alone will be applied and the patient will be allowed to move the wrist within a few weeks of surgery. Healing rates for fractures that require open surgery are not 100%; 10-20% of individuals may require additional treatment. Risks: Surgery includes additional risks, including stiffness, infection, nerve injury, the potential for nonunion, and re-operation. As Dr. Wolfe explains, "Recent revolutionary developments in operative techniques permit a percutaneous surgical approach, which is quicker, leads to faster recovery time, and provides good – if not better – healing rates than casting or open surgical treatment, with minimal to no incision." Percutaneous surgery enables the same degree of fracture fixation without an appreciable incision or blood loss. Still, complicated or displaced fractures of the scaphoid may not be amenable to this new approach. Technique: The surgeon makes a tiny incision in the skin (1-2mm long) and places a screw in the bone, across the fracture line, with the entire procedure usually being completed in less than an hour. Successful internal fixation of a scaphoid fracture, which has essentially healed. Because the incision is so small, a suture is usually not required. The hand is then held in a sterile cotton dressing and a plaster splint, which extends from the wrist to the midsection of the forearm. Rehabilitation begins almost immediately after surgery. Ten days later, the dressing and splint is exchanged for a removable plastic splint. New techniques also can include the manipulation of displaced fractured fragments arthroscopically or under fluoroscopic control prior to placing the fixation screw. This sometimes enables percutaneous fixation of fractures that would have otherwise required open surgical treatment. Benefits: A cast is not generally required after percutaneous surgery – only a splint. There are also the added advantages of early range of motion and an almost immediate resumption of activity once the scaphoid has healed. If successful, a patient can expect to begin to play sports or engage in other physical activities within 10-12 weeks of surgery. Healing: A splint should be kept on the injured wrist for approximately 8-12 weeks, and there should be clear evidence of union before its removal. Before athletes return to heavy physical activity, the physician may want to order a CT scan to confirm union. 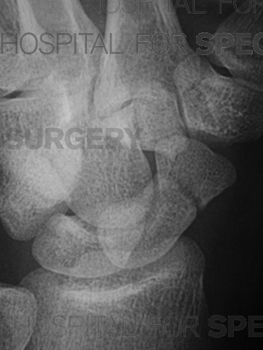 Risks: The physician should be very candid with a patient considering any surgical procedure for a scaphoid fracture. Infection, complications of anesthesia, non-union, hardware problems, and the potential need for hardware removal can all result from a surgical procedure. Percutaneous surgical procedures are highly technical procedures that are not easy to perform – there is a pronounced learning curve, and the surgeon performing these techniques should be well versed in these techniques in order to reduce the risk of a surgical complication. Despite the effective diagnostic and treatment options available today, Dr. Wolfe notes that he continues to see a high number of untreated scaphoid fractures that have progressed to nonunion. However, he adds that this may not be the result of a missed diagnosis, but rather more related to the relatively innocuous injury that causes a low level of suspicion. Recognition and awareness of scaphoid fractures is higher today among primary care providers, emergency room physicians, pediatricians, and sports trainers, but fully 15% of patients with suggestive physical findings and normal initial x-rays will have an "occult", or concealed, scaphoid fracture. 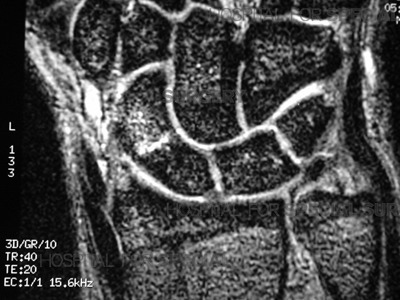 Specialized imaging studies are critical at an early stage to reduce the chance of scaphoid nonunion. 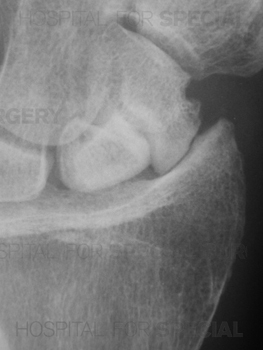 This image shows a chronic scaphoid fracture nonunion with osteoarthritic changes apparent in the adjacent joint. When faced with a scaphoid non-union, a physician is presented with many variables, including the tenuous blood supply to the scaphoid, the possibility of malposition of other bones, and degenerative arthritis. The most difficult problems are related to the time elapsed since the injury. Diagnosis: When evaluating a patient with a non-union, the physician may order additional imaging studies. An MRI or bone scan may be requested to assess the blood supply of the fracture, and a CT scan may be ordered to determine the alignment of the two fragments. Healing rates: Whereas a non-union caught within the first year can sometimes be treated like a recent scaphoid fracture, the time elapsed since fracture has a definite negative influence on the rate of healing. If the blood supply is compromised or completely disrupted (avascular) but the bones have not collapsed, there is still hope in the form of a vascular grafts, which facilitate blood flow by implanting a new blood vessel into the bone. However, despite these modern techniques, healing rates in completely avascular scaphoid nonunions are still approximately 50%. Treatment: If imaging studies show that the ununited ends of the bone are lined up perfectly, the surgeon may be able to percutaneously fix the scaphoid without an incision or bone graft, though outcomes for this type of treatment are still considered preliminary. If an un-united fracture is more than 2 months old, an open approach and bone graft will usually be indicated. In this case, a small piece of bone will be taken either from elsewhere on the patient’s wrist or pelvis and imbedded within the fracture line to enhance healing. If the bone fragments are grossly malaligned, the surgeon may need to open the fracture and craft a wedge-shaped piece of bone graft to fit between the broken pieces; usually a compression screw is used to hold the fragments and bone graft together. Although recent diagnostic and surgical advances have revolutionized treatment for scaphoid fractures, new innovations are currently being discovered and tested. Dr. Wolfe is encouraged by the potential for surgeons to use the injection of a biologic compound into a scaphoid fracture or non-union that would enhance the rate of bone healing and minimize the need for prolonged immobilization. Application of ultrasound or electric stimulation has also shown promise in the acceleration of healing in scaphoid fractures, and some studies have concluded that bone stimulation will expedite healing in non-unions as well. The use of biologics to accelerate healing have not entered the mainstream thus far, but there are encouraging signs that we may observe new horizons in treatment options in the years to come. A fracture or non-union of the scaphoid bone can be a complex and troubling injury, but the medical community has seen major advances in recognizing and treating these injuries in the last decade. 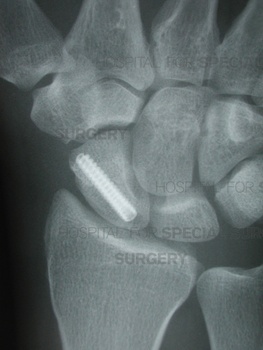 The advent of the percutaneous screw technique is a major step in treating scaphoid fractures and non-unions. The recently developed minimally invasive techniques in treating these injuries have made a significant impact on those who suffer these injuries, but one thing is unchanged - the earlier the recognition and treatment of scaphoid fractures, the better the overall outcome.